We can look in or look out of a hole in the wall. The building can also look through the hole. If the hole is large, the light coming in will allow us to read printed word or other coded information, or to make out the impression of a loved one’s figure in the partial darkness. If the hole is small it can transmit an image (like a lens) of what is outside onto a wall which is opposite the hole. 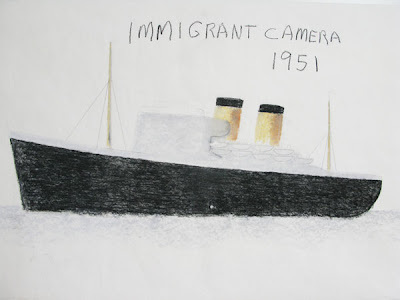 Thereby the room takes on the contemporary meaning offered by the Latin word “camera” or “room”. This condition also puts a person inside the eye, either between the lens (hole) and the retina (screen) or behind the retina, depending on how the architecture of the constructed eye is organized in this case. This offers the person here an opportunity to be an observer and what lies outside but is seen inside in real time becomes a visual attraction. It is possible that it becomes an attraction which is greater than the attraction of the material reality of what is being viewed . Is this because of a desire to occupy a reality with different substance than the one we know, or that we have been ready since we crouched in caves waiting for the sun, to welcome the spectacle that the sun can generate. The detached experience of reality which one can experience “in” the architecture of the camera obscura is an investigation which for me began in my back yard in Canada. I have a building which is roughly 3mX3mX3m which has a pinhole in one side and an occulus in the roof. I can easily darken the occulus to completely darken the room and activate the camera obscura. For me, one fascination in general is how the parts of any architectural structure will project outwards from the body, material specializations which replicate in some way, bodily function and need. This happens in the same way that a hat and a coat, glasses and shoes, will perform these functions while being tied very closely to our social identity as we move about. So, in turn the roof, walls, windows and flooring are the extensions which allow us to move about in some sense, within a new body, a territory. The bigger the floor, the softer the floor, the more comfort we have as we move around in our layer of softness which is our new body/world. 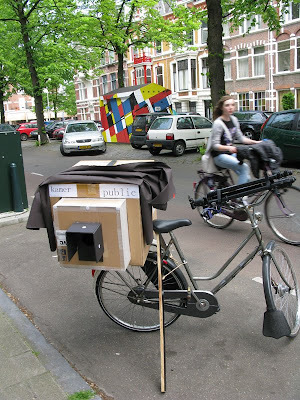 In May I will be out and about in The Hague with my bicycle-mounted camera obscura offering people the chance to look and think about what it is that attracts us to representations of what is already before us. And how the mechanisms of architecture and observation relocate us in our body /world.